If you’re a resident of the North West, which airport would you head for? Manchester? Liverpool? Leeds? Blackpool? Despite seeing a decrease in passenger numbers since its peak in 2006, Manchester International Airport remains the major flight nucleus of the north, with 2012 figures revealing an impressive 19.73million users. Escalating from its 689,468 customers in 1997, Liverpool John Lennon Airport has presented a challenge to Manchester’s jet-setting hub, coinciding with the slight Mancunian decline as it accumulated 5.47 passengers by 2007. In response to the success of its rival city, Manchester Airport has launched an outdoor advertising campaign in the regions of Merseyside and Warrington, attempting to claw back the million passengers who strayed to Liverpool and Birmingham in 2012. Targeting St Helens, Warrington, Knowsley and Huyton, Manchester Airport intends to secure a presence as a “global gateway to and from northern England”, displaying attractive prices such as £33 flights to Spain. The airport recently launched a ‘Fly Manchester’ campaign back in February in collaboration with Creative Spark, which was distributed across the outdoor arena in the form of bus and billboard advertising. Their latest marketing development reinforces Manchester even closer within their 22million catchment audience, as the airport offers a comprehensive destination list – topping even London Heathrow’s 180-strong route network with Manchester’s over 200. 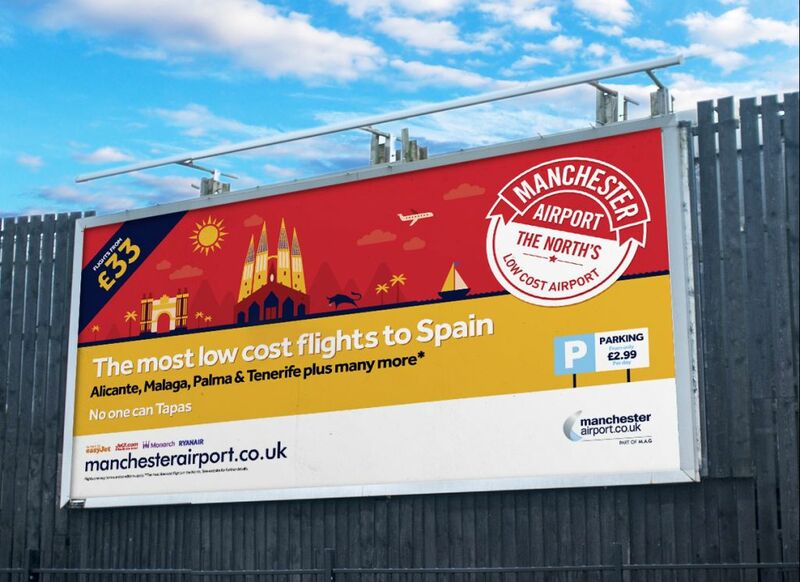 Manchester Airport’s Merseyside edition of ‘Fly Manchester’ markets the airport as the North’s primary low-cost option, encouraging travellers to utilise their services by raising awareness of Manchester’s recent increase in offerings. Due to Liverpool’s established association with budget airlines like Ryanair and Easyjet, many may overlook Manchester as the financially-friendly choice. The familiar orange face of Easyjet will in fact be flying to 32 places from Manchester – two more than Liverpool – and offering a more exotic selection of locations, including Manchester’s debut scheduled path to Moscow and also Egypt’s Sharm El Sheikh, Morocco’s Marrakech and a new-for-2013 flight to Thessalonki.